In the framework of the museum’s extroversive strategy and just before its full operation, the National Museum of Contemporary Art, Athens (EMST) presents a selection of works acquired during 2017 - 2018 from 5th December 2018 to 20th January 2019. This exhibition is a continuation of New Acquisitions 2014-2017 presented from November 2017 to January 2018. Historical and contemporary works by 22 major practitioners, donated by artists and outstanding Greek collectors, reinforce the existing sections of the collection and add new directions in terms of research and reflection on the issues of contemporary art. At the core of the new acquisitions in the EMST collection is the significant and generous donation of 68 works - mainly of Greek artists from various generations - by collecto r Mr Dakis Joannou, as well as a large donation of works by Greek and foreign artists from a collector-friend of the museum who has opted to remain anonymous. Human activity, archival treatment of the past, relation with life and death through symbols and references, Totemic motifs or the expanded and grandiose view of an ephemeral and often unnecessary daily routine are just some of the themes related to the works presented. In a critical moment, EMST operates again its temporary exhibition spaces and invites the public for one more view in its new acquisitions reinforcing its core, its collection, before it is permanently exhibited on the museum’s upper three floors. 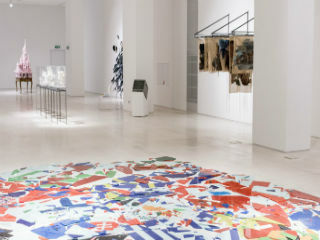 Following the exhibition La Verita e sempre un’ altra (Truth Is Always Something Else) held at the Galleria Nazionale d' Arte Moderna e Contemporanea in Rome, which ended on November of 2018 and included 23 works from the EMST Collection integrated within Time is Out of Joint, the current display of the Gallery’s permanent collection, EMST hosts at its space a selection of videos from the Collection of the Galleria Nazionale. A project winner of the 3rd edition of Italian Council (2018), a competition conceived by the Directorate-General for Contemporary Art and Architecture and Urban Peripheries (DGAAP) – an organism of the Italian Ministry for Cultural Heritage and Activities, to promote Italian contemporary art in the world. This exhibition, along with the presentation of the installation of Botto&Bruno The ballad of forgotten places, is the 3rd edition of the EMST series entitled EMST in the World, launched in 2016. Every project is bilateral and has always two parts, one in each country. A transcultural dialogue is possibly more necessary than ever, especially in Europe, it is expanded as an initiative of EMST to strengthen the strong and long-lasting connection between Italy and Greece. It was the first time that Galleria Nazionale opened its spaces to a foreign institution by integrating its collection into its permanent collection. The eight videos presented are characterized by the variety of approaches as well as by the use of the image in movement that alternates documentary forms with the artists' own films. The videos, created by Italian artists of various generations, offer a concise selection of the most interesting artistic research of Italian artists of recent decades. The idea to form this connection raised from program Tempo Forte Italia – Grecia 2018, an initiative launched by the Embassy of Italy in Athens together with Greek and Italian Institutional and non-Institutional actors, artists and experts in order to strengthen the cultural relationships between Italy and Greece. The aim is to cover all the various forms of “art”, from Classicism to Contemporary so as to have “more Italy in Greece and more Greece in Italy”. The National Museum of Contemporary Art, Athens (EMST) in collaboration with Fondazione Merz presents the work of Botto&Bruno The ballad of forgotten places, in the framework of the series EMST in the Word 3. The project was realized with the support of the Italian Council and it is included in the program Tempo Forte Italia – Grecia 2018, an initiative launched by the Embassy of Italy in Athens together with Greek and Italian Institutional and non-Institutional actors, artists and experts in order to strengthen the cultural relationships between Italy and Greece. The aim is to cover all the various forms of “art”, from Classicism to Contemporary so as to have “more Italy in Greece and more Greece in Italy”. The installation will start its journey from EMST in Athens and will continue to travel in Museums of other cities. The presentation of the work along with the selection of the video artworks of the collection of Galleria Nazionale d’Arte Moderna e Contemporanea compose the second part of the series EMST in the World, which started in 2016 and it includes collaborations of the Museum with international foundations and organizations, in a different country every time, aiming to the study of contemporary art, the dialogue, the cooperation, the exchange of knowledge, practices, and activities. This year’s edition of the series is dedicated to Italy. The Fondazione Merz is not new to the support of young Italian art internationally and has always worked on the construction of dialogues and relations between peoples and cultures. Among these, one of the most significant from a cultural and social point of view, concerns the countries of the Mediterranean basin which, not only because of geopolitical issues, have for some time been the protagonists of a vast cultural and artistic debate. The Fondazione Merz mentions about the work of Botto&Bruno: “The very differences, sometimes real divisions, between the countries of the Union, are an interesting area for reflection that some well-known artists are analysing and bringing into their work. Much of the media are, for obvious reasons, concentrated on the Middle Eastern countries. However, Fondazione Merz firmly believes that the care of places and communities must also start from the peripheries of Europe. The ballad of forgotten places has a real migrant nature. The work receives the traces and the signs of the time and of the cultures that have given shape and content. “The project stems from a reflection on the need for certain marginal places to be protected and cared for and on the need to preserve their memory. The idea we want to develop is that of a work that must be hosted within an institutional space. Considering what Auge said "our time does not produce ruins because it doesn't have the time" we started to build a structure that reminds of a contemporary ruin: the external walls of the work will therefore be the ruins of a modernist architecture that are also the ruins of its own utopia. Within this architecture, people can enter and walk in this exterior/interior where they will be surrounded, both on the walls and on the floor, by a 360 degrees suburban landscape with oxidation and stains, as if time had worked on it and had almost transformed into a daguerreotype. At the center of the room there will be a basement with a book of about 300 pages, containing about 20 years of photos we have taken of places which have now disappeared, transformed, forgotten, either terrain vagues, industrial areas or urban gardens located on the edge of the city. Each photograph of the book will be photocopied and then pictorially worked with the same technique used for the images on the walls. It is a flow in which the location of places is not important but the fundamental thing is their being united by a common destiny: the fact of having been forgotten. The Italian Council is a project of the Directorate-General for Contemporary Art and Architecture, and Urban Peripheries of the Ministry of the Italian Ministry for Cultural Heritage and Activities (MiBAC) with the aim to promote the production, awareness and circulation of contemporary Italian creativity in the visual arts. The artists’ project has the adhesion of the MiBAC’s Regional Secretariat for Piedmont and of the Italian Cultural Institutes of the cities of Athens, Madrid and Lisbon. The work, at the end of the exhibitions tour in the mentioned cities, will be definitive installed at Musei Reali of Turin.